Clear aligners are a popular method of teeth straightening, due to the fact that they are practically invisible. At Bedford Specialist Orthodontic Practice we offerthe Invisalign Clear Brace system, a solution which not only gives fantastic results, but is so aesthetic that your friends, family and work colleagues will hardly notice you are having treatment. We offer Invisalign Full, InvisalignLite and Invisalign Teen. Invisalign isn’t always a suitable technique for correcting every patient’s smile but our specialist clinicians are experienced users of alternative cosmetic appliances to suit your needs. Invisalign clear aligners can now shape your teen’s smile with less pain and more precision, and with shorter treatment times, if they are suitable for weekly aligner changes. 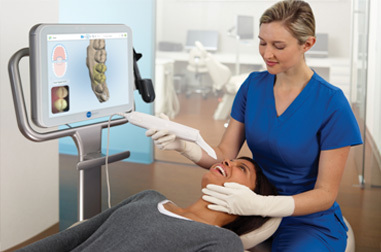 During Invisalign treatment, we use the iTero Element Scanner which allows us to take 3-D digital impressions by scanning the mouth, eliminating the need to packpaste in your mouth to take an impression. It’s quicker, it’s cleaner, and it’s far more accurate than traditional impressions. Please contact the practice for more information on Invisalign.